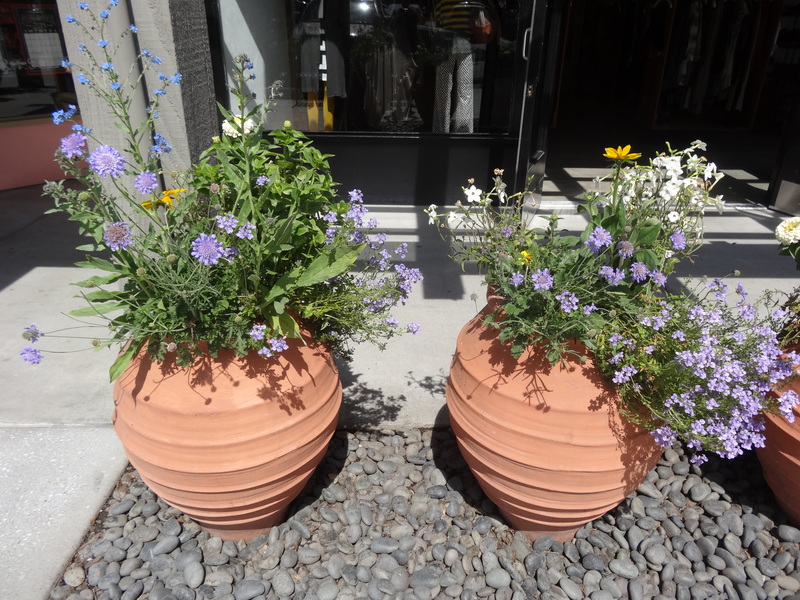 Spotted this one outside Raoul, a home and textiles shop in Santa Barbara. I love the idea of a bright paint color instead of the usual black, white, or dark green. 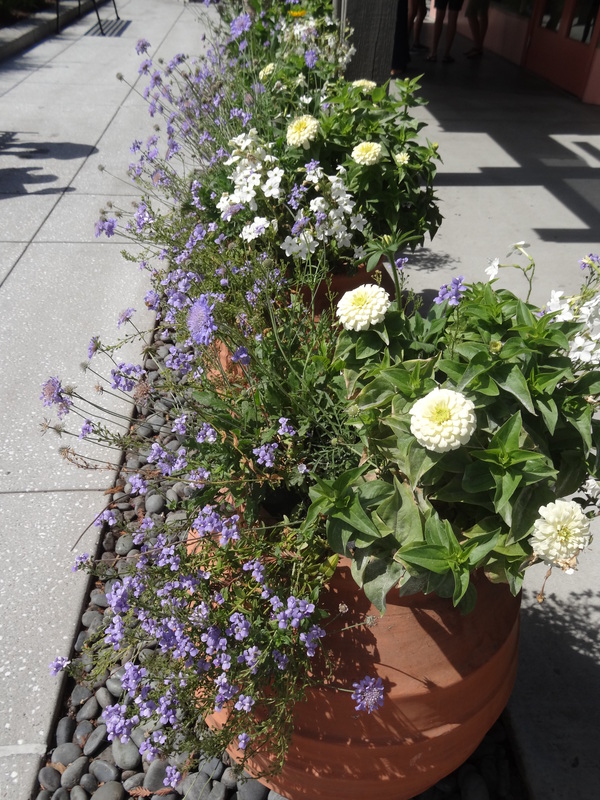 I think a bright paint color calls for something happy and carefree like lavender, and definitely an upright grower so you can show off the container. 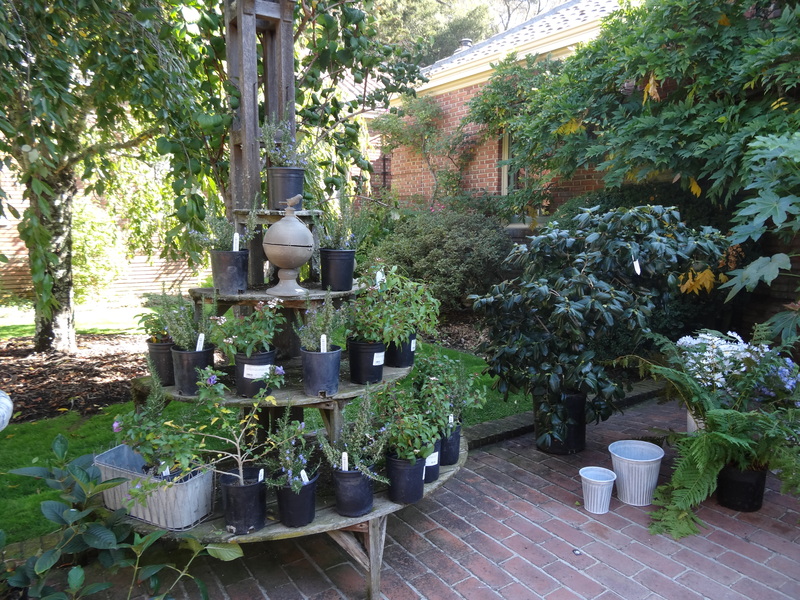 The other great idea here: instead of waiting forever for a topiary to shape up, underplant a citrus with lavender or rosemary. 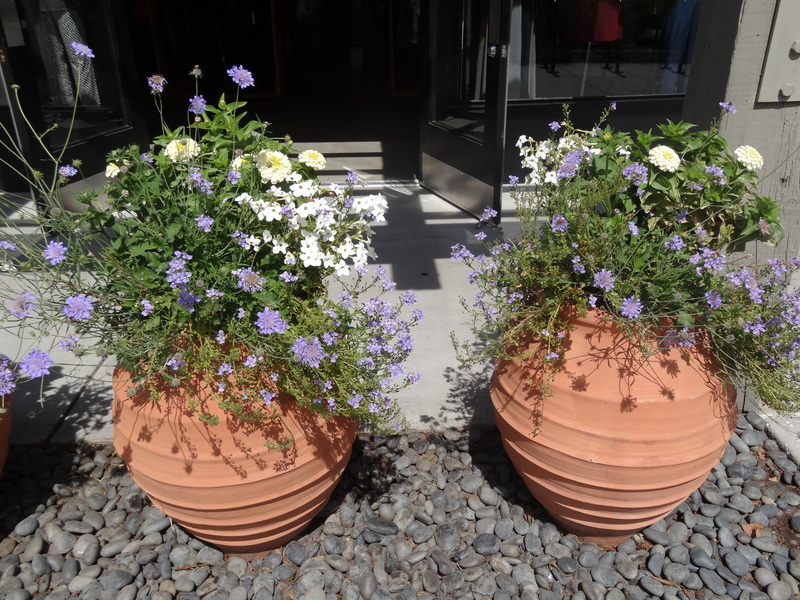 This is a beautiful, simple, serene way to style a front porch or back patio. The soft blues of the containers echo the paint color on the windows and doors. The arrangement of the containers is almost, but not quite, symmetrical. The containers are each slightly different, and there are two palm varieties. Furniture and accessories are natural tones: wood, wicker, and jute. 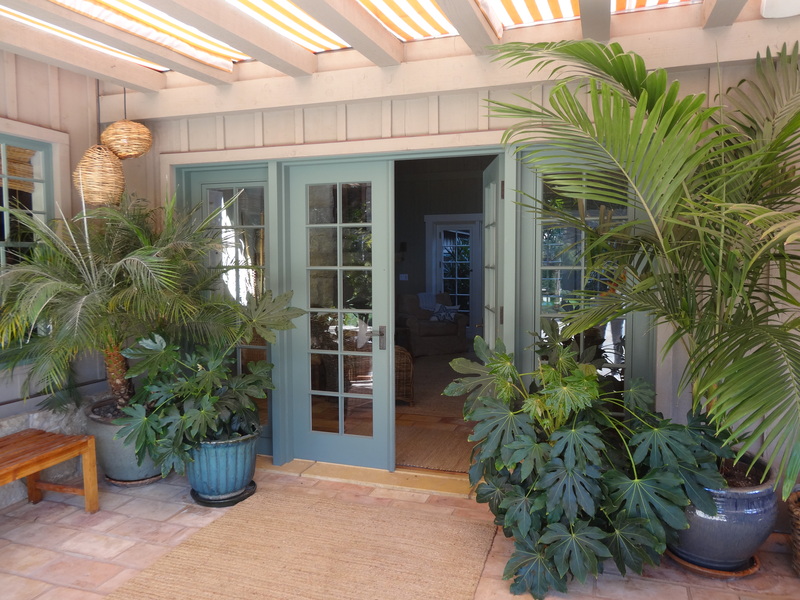 I love the wicker pendant lights (this is a covered patio). These bentwood pendants from West Elm would look great too. In the best stroke of luck ever, I found these polished clay pots secondhand (buying used is one of my new year’s gardening resolutions). They don’t quite match but they’re beautiful, heavy, good quality pots. 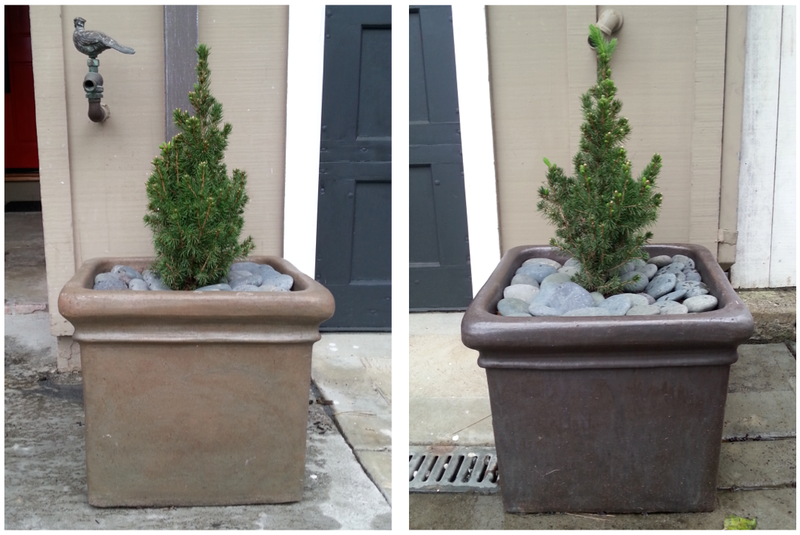 I planted them with baby pine trees that I ‘recycled’ from Christmas decorations, added tumbled stones to keep water in and raccoons out, and put them out front on either side of the garage door. I plan to prune the trees into tall, narrow forms as they grow. If that doesn’t work out, I’ll replace them with podocarpus. I managed to pop them in and snap some pictures before it started pouring again. 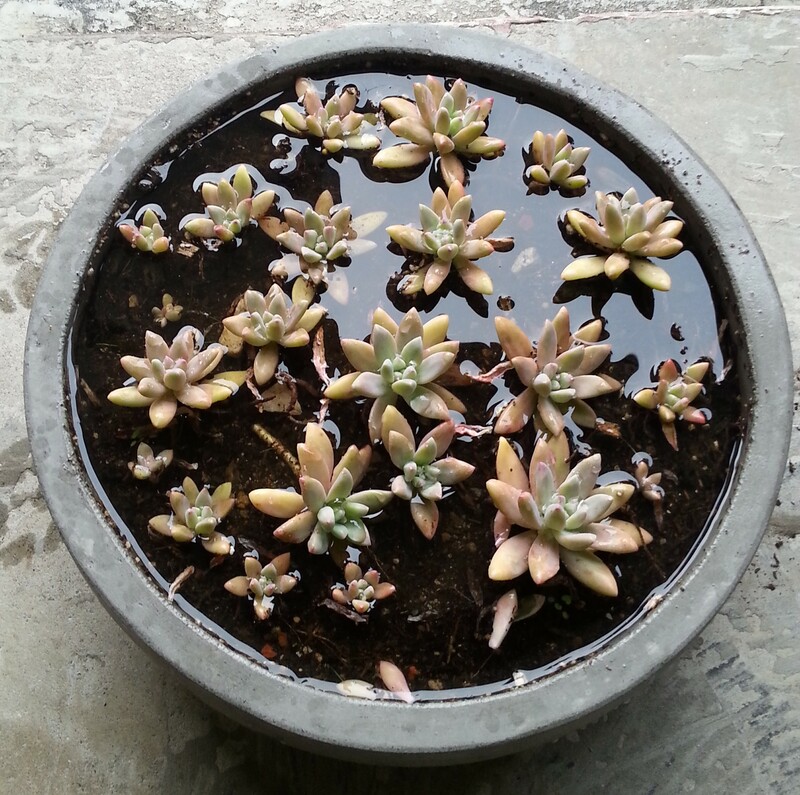 We desperately need this rain, but I do think the succulents have had enough. 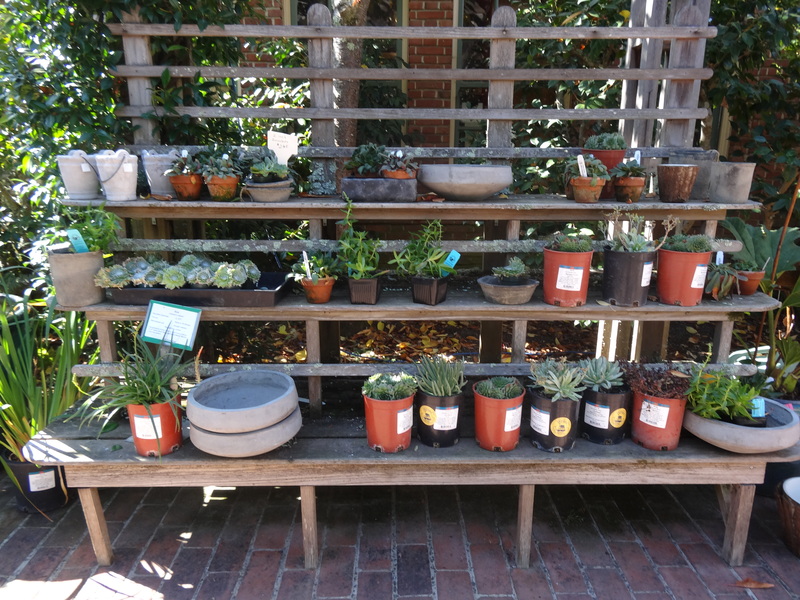 These beauties are used to display plants and containers for sale in the shop at Filoli. They’d be a great way to add height and lushness to a small patio or to screen an ugly fence. I’d fill them with succulents in stone or faded terra cotta pots. 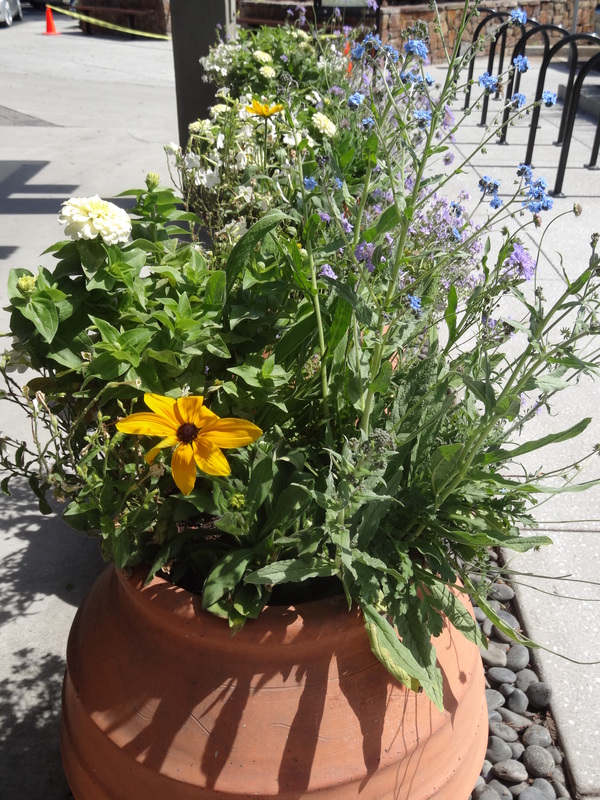 Sculptural containers filled with low maintenance plants that you don’t have to water every day: perfect. Everything is kept loose and informal and easy, with simple, classic pale blues paired with soft yellows and white. The garden bed is filled in with river stones, and the terra-cotta pots are set on top. This would be such a cool solution to a garden bed you haven’t gotten around to yet. 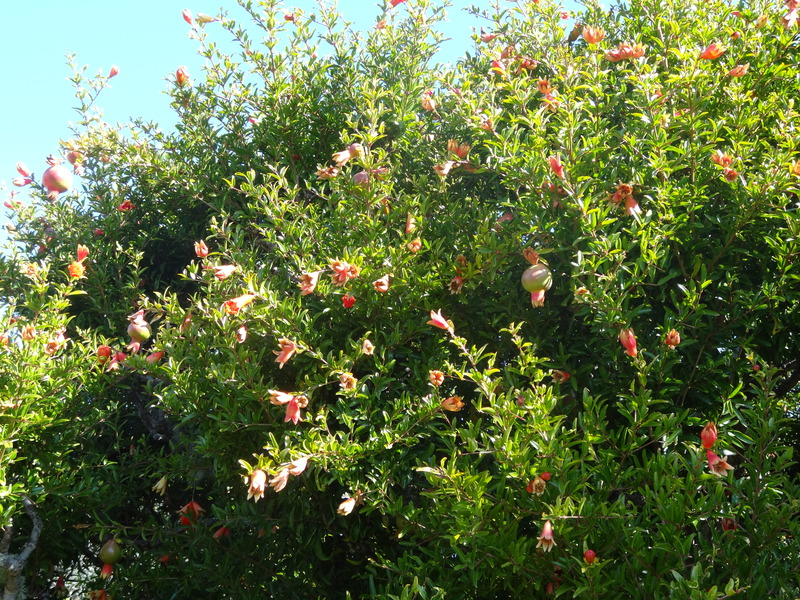 Here’s what I think is in these (Don’t you wish that people would put up little signs with plant lists? ): Scabiosa ‘Butterfly Blue’, Zinnia ‘Dreamland’, Rudbeckia/Black-Eyed Susan, Chinese Forget-Me-Not (Cynoglossum amabile), and Thunbergia ‘Alata Sunrise White’.